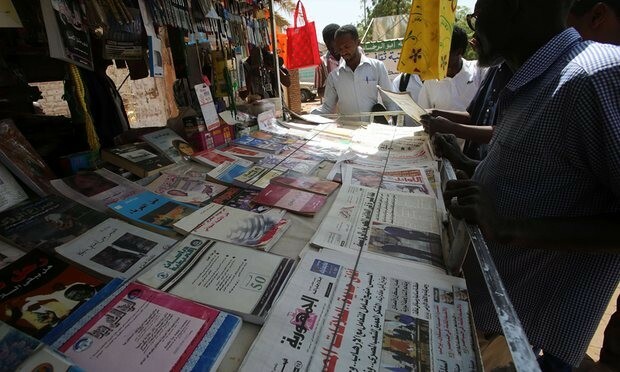 Banning and censorship of newspapers over the weekend signals that media is the “first to pay the price” for the State of Emergency in Sudan. The National Intelligence and Security Service (NISS) summoned the administration of El Jareeda newspaper and has demanded that it reports daily to the offices of the security apparatus for correction and approval of the newspaper before it is printed. The NISS also demanded that the contents of its website of El Jareeda newspaper are also checked. The administration of the newspaper has decided that it will neither go nor publish; they will meet today with a legal advisor, Nabil Adib, to determine a course of action. The NISS has also been active elsewhere. Akhbar El Watan newspaper, the mouthpiece of the Sudanese Congress Party, has been banned for the fifth week in a row. The network expects an intensification of gagging of newspapers and journalists in the coming days. It appealed to journalists to be more steadfast in their work. The Sudanese Journalists’ Network said last week that 79 journalists have been arrested since December, including some who have spent a month or more in the prisons and detention centres. The network said in a statement that there are newspapers such as El Jareeda, El Midan, Akhbar El Watan, and El Baath have not been accessible to the readers for weeks. The director of El Ashigaa printing house, Mohamed Widaa, said that the price for a ton of newsprint paper has risen from SDG 75,000 to SDG 93,000 and described this as a disaster for the press industry. Thousands demonstrate in Sudanese cities calling for Al Bashir to ‘just fall, that’s all’ following the declaration of a State of Emergency and reshuffles in government. Yesterday, thousands of Sudanese people protested in Khartoum state against the government's declaration of a State of Emergency. In addition, the marches were held to show discontent over placement of military personnel as heads of state and ousting of the vice-president and prime minister from government. The demonstrations, now in their third month, centred around demands for Al Bashir and his regime to step down from power. This followed the declaration of a State of Emergency in Sudan made by Al Bashir the previous evening. Later on Saturday, Al Bashir appointed military rulers to the country’s 18 states and ousted First Vice-President Bakri Hasan Saleh and Prime Minister Motaz Mousa. The vice-president was replaced by Defence Minister Lt Gen Awad Bin Auf, the prime minister by Mohamed Tahir Eila. The centre of Omdurman witnessed a mass demonstration with cries for freedom, peace, and justice. Security forces used tear gas and live ammunition to disperse demonstrators, causing injuries. Troops also raided homes and arrested people. According to a statement issued by the Sudanese Central Doctors' Committee, three people in Omdurman were injured by live fire. In the short statement made on Sunday, they said one person was shot in the head, another in the hand, and the third in the arm. The areas of Azozab, Doroshab, Samarab, Hamadab, and Shambat in Khartoum North, and Kalakla and Burri in Khartoum, and Ombadda in Omdurman saw similar demonstrations calling for the overthrow of the regime and Al Bashir. On Saturday morning, a convoy of military vehicles carrying soldiers and other security forces patrolled the capital, Khartoum. Videos emerged on social media of students being forced to leave University of Medicine and Technology in Khartoum. One video shows students being beaten by security forces. Yesterday, Wad Madani, capital of El Gezira state, witnessed mass demonstrations denouncing the regime's policies. Demonstrators set fire to tires in the streets and chanted slogans calling for freedom and the overthrow of the regime. In eastern Sudan, military forces patrolled El Gedaref on Saturday. Residents said the city saw military vehicles including the armed forces, paramilitary Rapid Support Forces, and police forces patrolling the city's main streets on Saturday. The Doctors Information Office released a statement detailing the storming of Khartoum Doctors Residence on Saturday. According to the statement, security forces beat doctors and detained them. In their statement, doctors renewed their commitment to strike from non-emergency cases and confirmed their complete withdrawal from state hospitals. They called on all medics to gather in emergency sections, in coordination with demonstrations, to treat the injured and to work in the streets until freedom and justice are achieved.